Posted by Jen Pappas in Chile Posts. Looking back on our time in Chile, we were able to recall quite a few cultural nuances we’d be fools not to share. • Street performers that actually perform in the middle of intersections, in between cars stopped at the traffic lights. We witnessed jugglers, dancers, cheerleaders and even a mime doing their thing while the light was red, stopping to collect money from drivers moments before the light would change. • We found some of our favorite new beverages while in Chile. No, the sickeningly sweet and disgustingly named Pap soda did not make the cut. 1) Mote con Huesillo is a tasty desert beverage you actually eat as well as drink. It´s made from boiled barley, sweetened water and rehydrated sun dried peaches. 2) Cola de Mono is typically drunk only around Christmas time and consists of coffee, milk, aguardiente liqueur, and flavored with vanilla and cloves. The name literally means Tail of the Monkey and is quite potent. 3)Kunstmann beer is just really good- sort of tastes like Newcastle. • There is a very serious love and devotion for Chorrillana in Chile, with entire restaurants serving this dish and this dish only. 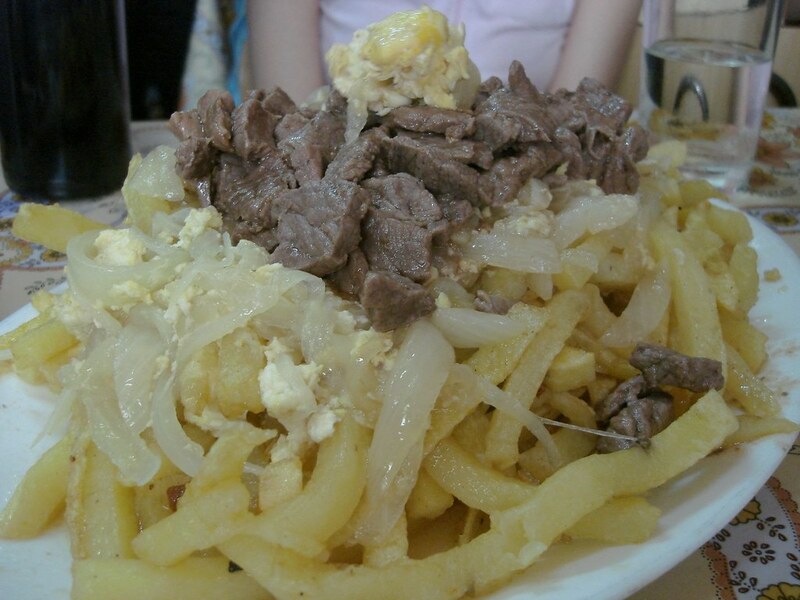 Technically, Chorrillana is a heaping plate of french fries covered in chopped steak, fried egg and grilled onion. We call it a heart attack waiting to happen. • Wild packs of disheveled dogs in dire need of a bath rule the streets. They are the true cops, robbers and politicians of Chile. • Music is truly the lifeblood of South America and is regularly piped into schoolyards at recess, buses during rush hour, public restrooms and town squares. Music is everywhere. Posted by Jen Pappas in Valparaiso text. Valparaiso is a city that knows itself quite well. Long deemed the cultural center of Chile, the city was declared a Unesco World Heritage site in 2003. Bright, crumbling homes are scattered haphazardly across hillsides overlooking the Pacific. Ancient ascensors (funicular elevators) clamber up the steepness, full of secrets dating back to 1883 and 1917. Virtually every surface- stairwells, sidewalks and concrete walls are littered with graffiti, stencils and street art. Bohemians, poets and misfits flock to Valparaiso not only for its creative spirit and artistic freedom but for its natural beauty and historic filth. Somewhat of a cross between San Francisco and turn-of-the-century Paris, Valparaiso has plenty to offer in the way of visual stimulus. The hostel we stayed in was a perfect example. The house was built in 1925 and only recently renovated and re-designed by a Chilean artist. There was in fact a real trapeze hanging from the high rafters near the breakfast table. Steve managed to hoist himself up not once, but twice, graciously posing for other backpackers who wanted photographic proof for their friends and family back home. We spent the majority of our time in Valparaiso roaming the streets, befriending bar owners, touring the home of Chile’s most prized poet, (Pablo Neruda), soaking up street art, bumming around cafes and hiking up hills. We also took a cheap harbor cruise, found real tofu and over-tipped a Chilean lounge singer at Cinzano, a local haunt that’s been around since 1896.